Bullet hell is a very popular genre of game in japan.We in the US dont get alot of these type of game.My experience with them is pretty limited however i love every FRUSTRATING second of it. This is one type of game what really will kill you eyesight and make you think about your career as a gamer. - Are top-down shooting games that require the player to move around large numbers of projectiles while returning fire. - Are notoriously difficult for the average gamer, due to the high number of bullets on-screen at any given time and the reaction time needed to find gaps to pass through. - Test both your dodging skills and your resistance to seizures. I have only played but a handfull of bullet hell games but i did notice something...The storyline is probably the worst part of the game. Now before you guys get all elite on me,I do know that the story is not a major component. Its just that maybe with a really good storyline i would actually go out and purchase a copy of the game or even an arcade machine! the two that stuck out to me was a short and easy one that Me and Amy were playing at a convention awhile back. If im not mistaken it was Mushihime same Futari, an import for the 360, and the other i played while Draco watched being Castle of Shikigami for the Wii. These games were challenging yet they were easy just to pick up and play without knowing much but flashy bullets that didnt come from you are bad. In my personal opinion we need more of these games over here. 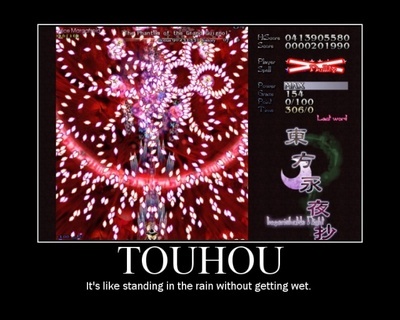 Even more so than what has popped up in the Playstaion store as of late and the popular(i believe) Touhou games. Hopefully with the coming of the new generation of consoles we will see plenty more...provided that you fellow gamers are MAN ENOUGH FOR THE COLORS!